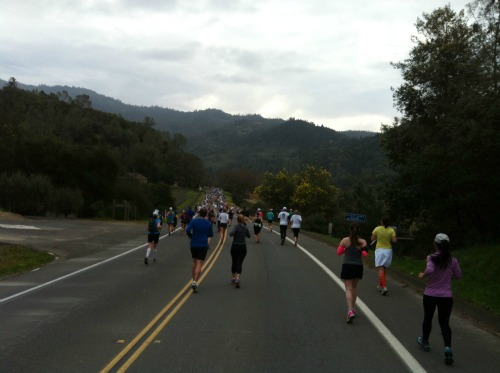 Traveling, running and wine-tasting – it’s the perfect combination for a destination race and the Napa Valley Marathon is the perfect event for all three. 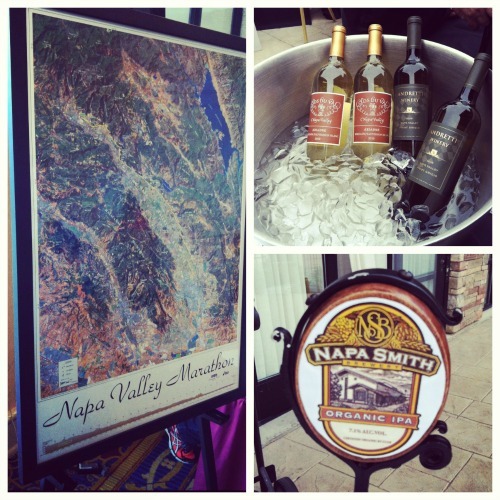 Recently I traveled across the country to Napa, California to run the 35 Annual Kaiser Permanente Napa Valley Marathon and attend Wine Sisterhood’s Second Annual Gathering. I spent five blissful days in the valley so I’ve got some great wineries to recommend that you don’t want to miss, but I have to start with the marathon. It was amazing and a must-do if you’re looking for a beautiful, well-organized, destination race. It’s been heralded as one of the best destination races by many magazines and running sites; and I found out firsthand why. It was BEAUTIFUL. The race, held this year on March 3, had perfect, cool weather and the most gorgeous scenery for 26.2 miles. Oh, and did I mention it was pretty much all downhill? Yes, there were rolling hills in the beginning but even then the elevation was declining. It was the smallest marathon I’ve run – 2,300 runners compared to the masses who take on Chicago and the Marine Corps – but that’s still plenty of people and I never felt alone. The race was well organized, the aid stations were well staffed and everyone was extremely helpful, encouraging and attentive. It’s a great course for beginners. It’s scenic, organized, and mostly downhill or flat. There is a 6 hour time limit. If you know you’re going to be longer this is not the race for you. They enforce the no headphone rule. They have bike marshals on the course and will call you out. Bring a camera. Your view for 26.2 miles is amazing. They have a 5K. If you want to run but not a full marathon you’ve got options. The race normally sells out. If you’re planning to run it make sure you get your registration taken care of early. Be ready to sip at the expo. The live jazz, beer on tap and wine tasting was a nice touch. They’re known for their awesome sweat bags. 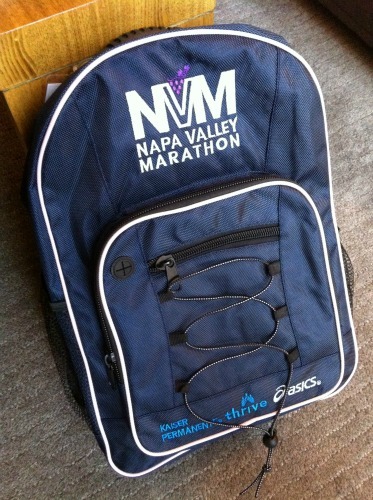 Well they’re more like really nice duffel bags or backpacks. The choice was ours. Stay awhile. You’re in Napa. Plan to stay a few extra days and enjoy the valley with friends, your spouse or even solo. 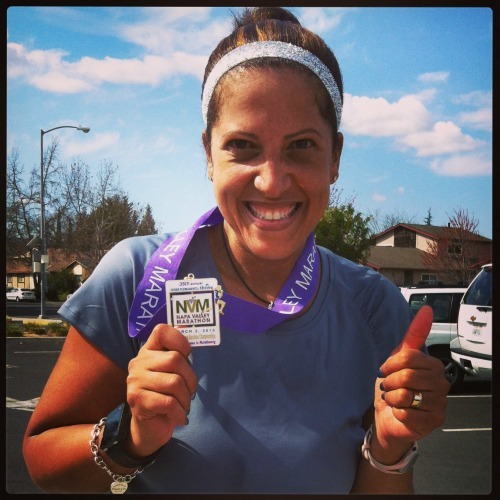 Lorraine Robertson is an author, nationally published freelance writer and creator of the site RunWifeyRun.com. After three marathons, 13 half marathons and countless smaller races she’s still packing her running shoes and looking for her next great race. 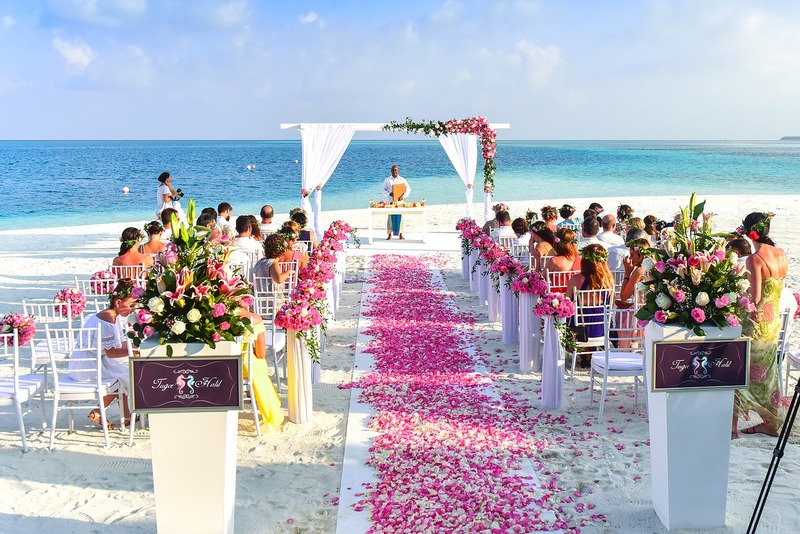 Lorraine was featured on the Travel Channel’s “Great Cruises: Why Not The Mediterranean?” television show and her life-changing wedding appeared on TLC’s “A Wedding Story.” She lives in the metro Atlanta area with her husband, Napoleon and their kids, Miles, 11, and Milan, 9.